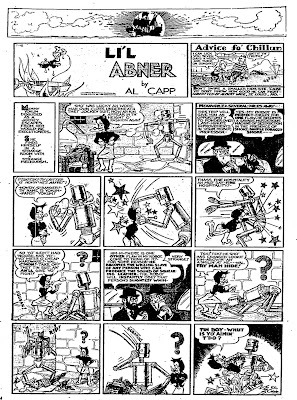 This Li'l Abner comic by Al Capp ran in the July 18, 1937 edition of the Charleston Gazette (Charleston, West Virginia). 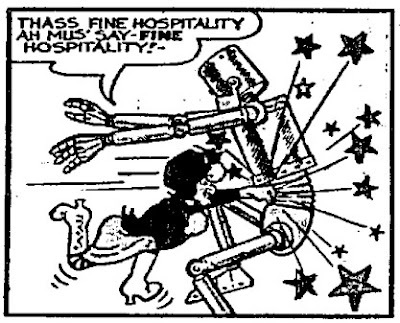 The professor refers to his robot as perfect, yet capable of being a “savage” and “murderous.” This early development of the robot archetype seems to parallel attitudes toward Native Americans in early American history. I would be interested to see if this is merely a coincidence, or if this appears in other comics as well. Why does Mammy wear CFM boots? What is he fixin' to do? Hmmm, there are a LOT of interesting things going on in this comic!!! First, the 2 scientists, or "Older Freud" and "Younger Freud" as I refer to them, switch places when they are shown. Hmmm, did they stop for lunch somewhere? And if you knew your robot could smell, first off, congrats, that is a REALLY hard thing to do! Second off, if a fairly common smell will make it violate a Law of Robotics, perhaps turning off that circuit would be advisable.